Cover Photo: The Grand Éléphant on his daily stroll © Guilhem Vellut. Perched on the banks of the Loire River in western France, Nantes has long been a bustling hub of both the shipping industry and modern artistic conceptions. As the hometown of 19th-century French novelist and poet Jules Verne, and a place of inspiration for the Surrealist movement, it is only right that such a meeting point between mechanical and imaginative innovation has produced the incredible Les Machines de l’Île. Nestled in an abandoned shipyard on one of the river’s great islands, this spectacular attraction and park brings to life the futuristic walking and flying creatures found in both Verne’s writings and the artist and inventor Leonardo da Vinci’s works like never before. As visitors step into the park to see, experience and even ride these towering robots, they’re equally exploring a piece of this French city’s industrial past. Ride Le Héron. Photo by Fourrure. Whatever it might seem at first glance, Les Machines de l’Île is much more than your average amusement park. Inside the Parc des Chantiers on the Île de Nantes, magical, hand-constructed animals devised from metal sheets, poplar wood, wires and cables walk, fly and crawl around, with all their working components on show for the world to see. 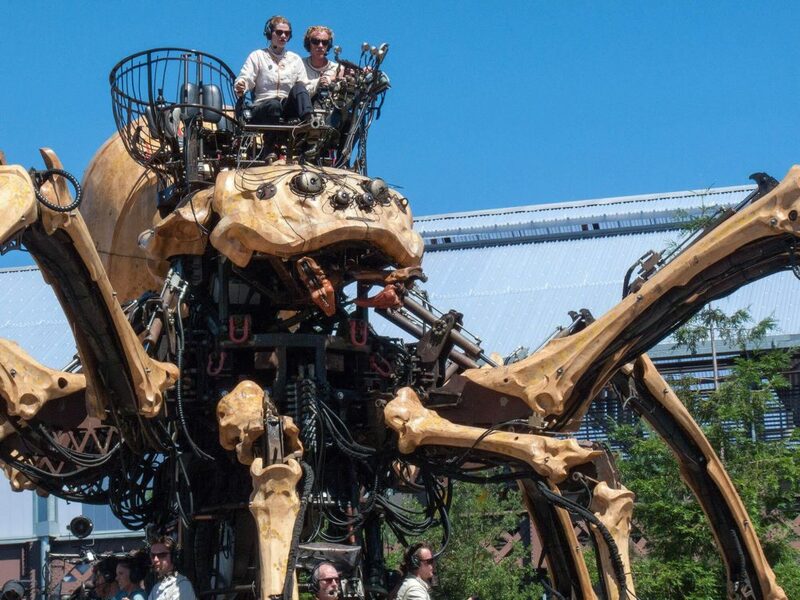 The project’s pièce de résistance is the Grand Éléphant: a 12-metre high, 48-tonne mechanical creature that winds its way through the island’s streets each day, trumpeting and spouting water at curious visitors. The creations are designed to be touched, explored and even ridden in – at the top of the elephant is a deck that can hold 50 people for a 30-minute ride along one of three routes at a steady pace of three kilometres per hour. To climb up to this platform, you take a winding staircase through the animal’s core, where the nuts and bolts of its inner workings and the 62 hydraulic, pneumatic and gas cylinders that keep it moving can be seen. This surreal interactive workshop and performance space was the brainchild of two French visionaries: François Delarozière, director of the theatrical production company La Machine, and Pierre Orefice, artistic director of the Manaus association which creates and produces outdoor performances and events in urban spaces. “First of all, Les Machines de l’Île is definitely not a theme park,” Delarozière began when we asked him about the inspiration behind the park. ​“It’s a cultural and touristic project that exists in the public arena, in the real-life downtown city. Our Grand Éléphant shares the streets and squares with pedestrians; citizens who are going to work or are on their way home,” Delarozière concludes, underscoring the impact of the park on the local community. All aboard Le Chenille. Photo by Fourrure. 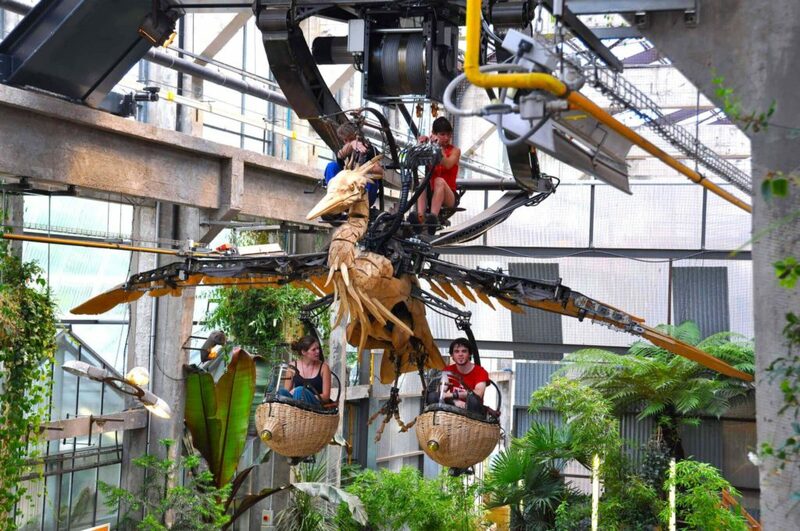 At the heart of the park is La Galerie des Machines – a greenhouse packed with tropical plants and smaller mechanical creations that are yet to come to life. It’s here that the newly built animals are tested, while machinists wander around explaining how each piece works to the visitors. 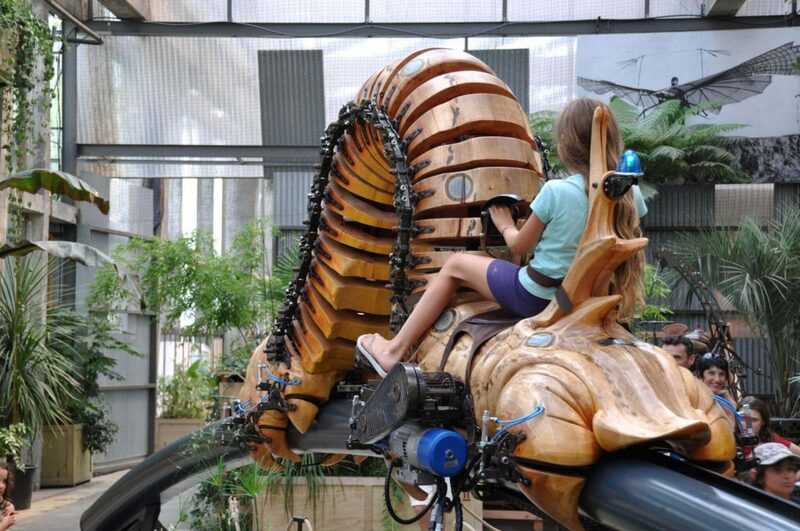 Among the foliage you’ll find mechanical fish, caterpillars, spiders and even a giant ant. There’s also a flight simulator that takes riders on a 100 mph adventure through the skies on the back of a flea. Thanks to his company’s work in bringing artists and engineers to the site, La Machine’s workshop on Boulevard Léon Bureau is today open to the public and a hive of activity. Hands move quickly and expertly to create the masterpieces; craftsmen pore over tools and blueprints, revealing the skill and dedication that goes into each creation. Kumo, the giant spider. Photo by Aurélien Dury. In the late ​’90s, the local council decided to go ahead with this project to put Nantes’ artistic heritage onto the world stage. This philosophy is at the core of the park’s next initiative: The Heron’s Tree Project, which is due to open in 2021. The daring plan proposes to dig out a five-acre quarry to house an enormous mechanical tree as the centrepiece for Les Machines de l’Île. The 30-metre tall, 50-metre wide tree will be the base for this ​‘city in the sky’, crowned with two mechanical herons that will carry 12 people apiece for six flights every hour. This will be flanked with hanging gardens on 22 walkable branches and surrounded by mechanical osprey eagles gliding along zip lines. Explore the Château des ducs de Bretagne. The artistry of Les Machines isn’t just felt on the island. As well as this mechanical menagerie, the city is home to more than 40 public artworks, 36 theatres and 14 museums. The self-guided Le Voyage à Nantes walking tour reveals the city’s creative tradition in action. Start at the Le Lieu Unique gallery on Rue de la Biscuiterie to see circus performances, experimental art shows or to browse the vintage record store, before strolling down the Saint-Nazaire art trail. This 60 kilometre-long path runs along the city’s estuary, showcasing works from 30 internationally acclaimed artists, including French painter and sculptor Daniel Buren. 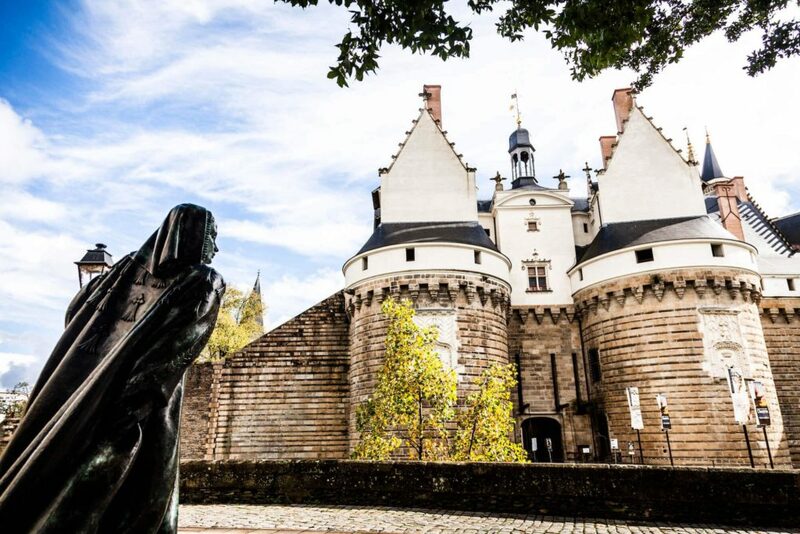 To see the town’s more traditional architectural roots, head into Centre-Ville for the Château des ducs de Bretagne – Nantes’ 12th-century castle and stronghold of the Dukes of Brittany. Equally, a short walk to the other side of the town centre will lead you to Place Graslin, where you can take in two of the city’s finest architectural gems: Théâtre Graslin, the neoclassical opera house, and La Cigale brasserie, a 19th-century restaurant decorated with colourful Belle Époque wall tiles and offering the region’s famous crepes. With the mechanical animals of Les Machines retreating away into the workshops for the night, complete your day in Nantes with a cocktail at Le Nid: a bar located on the 32nd floor of architect Claude Devorsine’s Tour Bretagne skyscraper. From their terrace, you can watch the sun set over the eclectic landscape of this former French industrial powerhouse, which has now firmly turned its focus to interactive and experimental art.